From time to time I come across an old piece of electronics that I want to harvest some parts from. Stepping motors from floppy disk drives, Solenoids from zip drives, small DC motors from CD drives to name a few of my favorites. 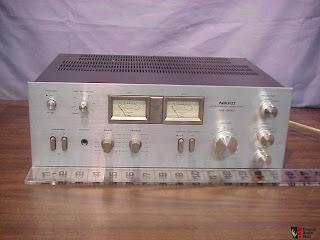 Audio Amplifiers in particular are my very favorit. They have lots of interesting and hard to find pieces. Without further adieu, here's a before shot of this vintage 80's "Nikko NA-550 Integrated Amplifier" that I picked up at a landfill a few weeks ago. For anyone curious, the power button was jammed in the off position, which is probably what earned it a spot at the dump. 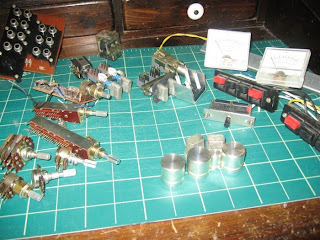 Got a bunch of nice metal knobs, some dB meters, some very nice Alps selector switches, some Alps potentiometers, a 2.5A breaker and some other misc parts. Well... it did come from the landfill. I tried turning it on (since the thing looked really cool) but it wouldn't. By the time I found out the power button was jammed it was too late. Hi, are you selling the parts? If you are selling the parts. Hi again, I am trying to fix MY Nikko, and could really use the selector switch from your parts. I have one that is in well working condition. Can't seem to find them any where. Does anyone know how much they are worth?